Let's take a look back, and see what we started with, shall we? The cabinetry is Martha Stewart Living from The Home Depot. The style is Ox Hill in the Picket Fence colour. Originally, when I met with the kitchen designer to select the cabinetry, I was going to go with the Sharkey Grey colour. 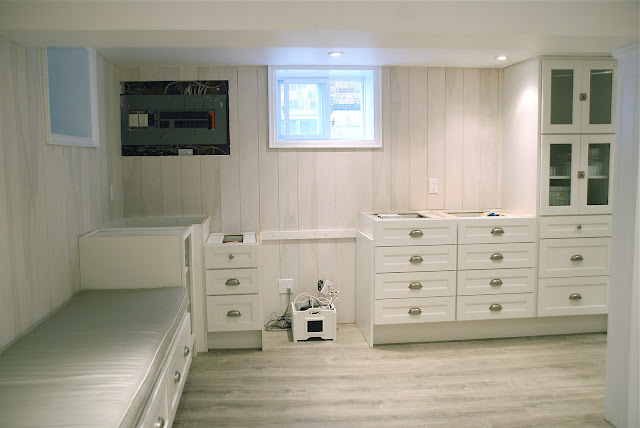 Then I realized how little natural light the basement gets (those two windows above the banquette face the underside of our deck), so decided to go with the white cabinets instead. The white also provides a nice break between the DIY whitewashed plank walls and the Kamina Oak laminate flooring. 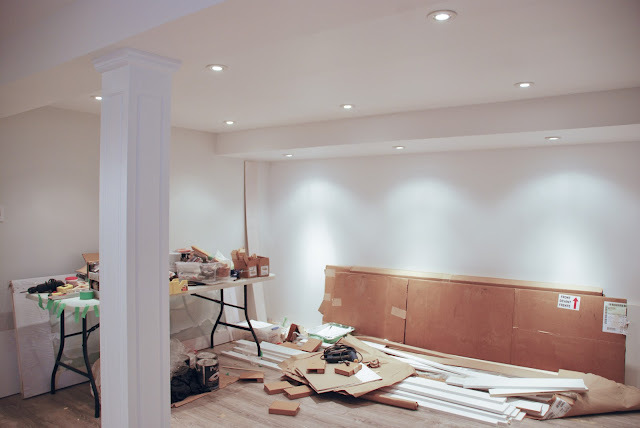 We kept all the other walls and ceiling light and bright, painting them in Whitewash White by Para Paints. I love love love all the little details. The Martha Stewart Matchbox Catch paired with the ribbed glass is exquisite. It makes the perfect little 'click' sound when it catches. And then there's the banquette. 106" of cushiony goodness. Room enough to stretch out and take a nap (I tried!). The sewing for the cushion is courtesy of my fabulous sponsor Tonic Living using outdoor fabric and a ticking stripe that I provided. I thought we were going to have to DIY the banquette using kitchen cabinets but that Martha, so smart, she makes these bench cabinets with pull out drawers. The banquette is flanked with small bookcases (which are actually kitchen upper cabinets finished with a trim piece on the front edge). This area is looking a little unfinished. The dropped area is where the home office desk will go. Still have to figure out a solution for that messy tangle of cables and something to cover the electrical panel in the corner. Countertops are coming in two weeks too. Here's the view from the stair landing. You can see the laundry room peeking out from the left and the broom closet (wink) and Chloe's secret playhouse-to-be on the right. And do you see that Alanna Cavanagh silk screen print hanging on the wall? We purchased that piece of art almost three years ago and have had it wrapped in storage ever since. I just knew where it was going to go in my someday dream basement. And there it is! First thing you'll see when you come downstairs. It feels incredibly good to finally get it up on the wall. ...and there's a big pile o'stuff that needs to be dealt with. Update: Here's what the basement looks like today. Want to see what the basement looked like before? Check out the video tour here. Its fun to see what ideas I mention in the video that we did end up doing and which ones we changed along the way. This project was sponsored by The Home Depot Canada. All thoughts and opinions are mine. this space is so beautiful. i have just been staring at it. 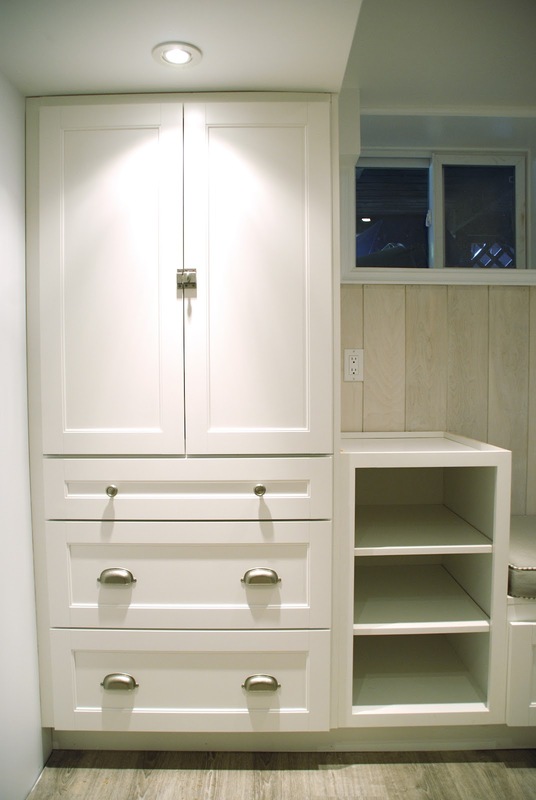 when i get to redo a kitchen, i am so going to use those cabinets. amazing!! Yay! Thanks for the peek! That print is awesome.. so perfect for the space. 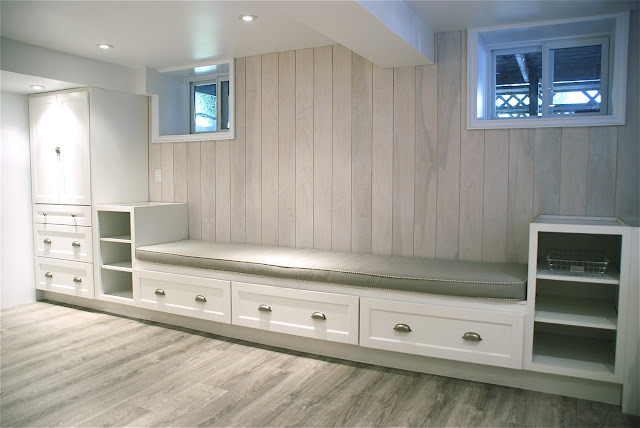 The cabinetry is great and that bench is so cozy looking. Gotta love Tonic Living! Jen! I think it was a sound move to show us this part-way progress as it helps to keep it real. 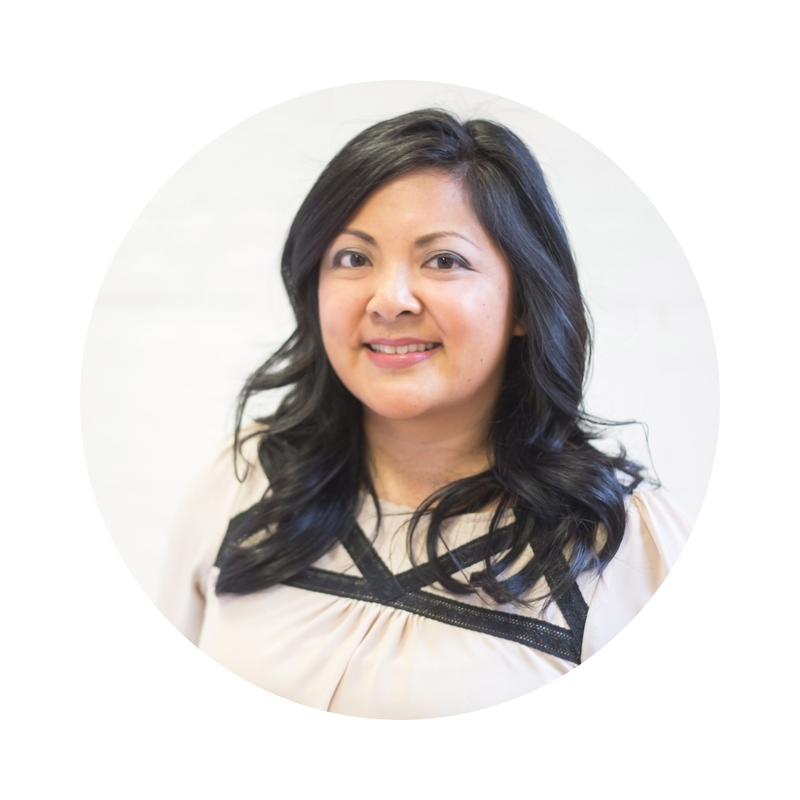 Aren't we all undergoing some kind of improvements that should be celebrated along the way? House improvements or otherwise? AND? ...looking Stellar. Chloe looks perfect on her "runway"! Looking good! Plus all that storage...I'm so jealous! Wow! This looks amazing!! 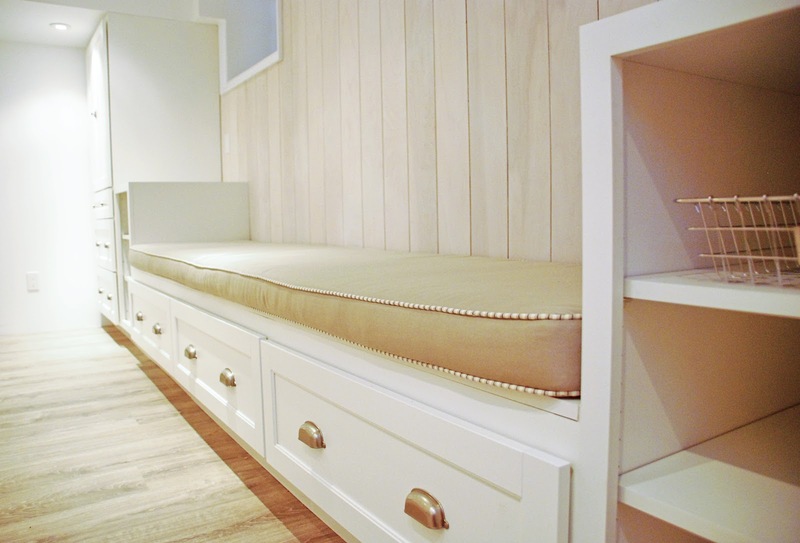 I adore the banquette with the drawers. What great use of space. And the wavy glass cabinets with the old fashioned closures are awesome. What an amazing transformation already. i'll write more later, but i just had to pop in to tell you how refreshing that whitewashed plank and flooring is. i love it with the white cabinetry. 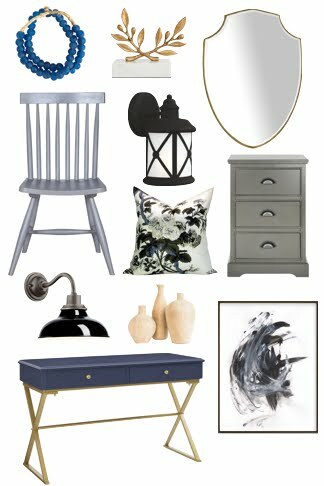 also, i'm really glad you sourced the martha bench and cushion... i need something exactly like it for a tricky little space i'm working on. love, love, love. beautiful as usual! Wow! 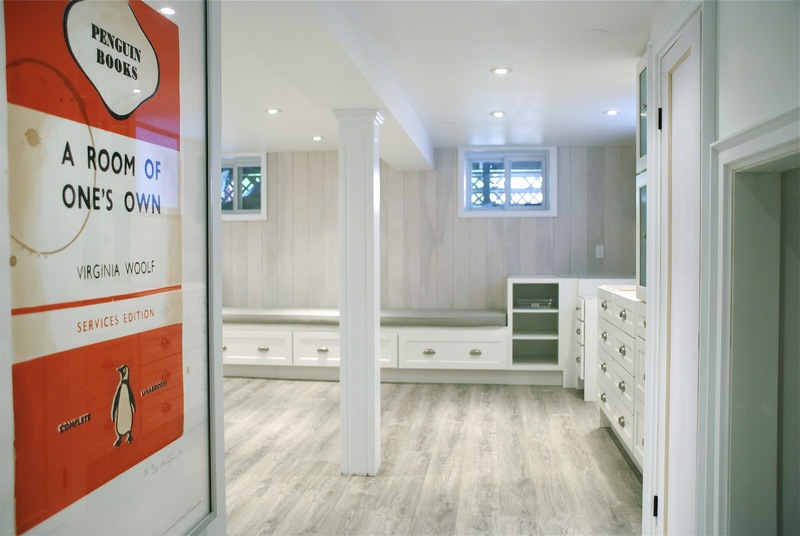 We love everything about this basement. 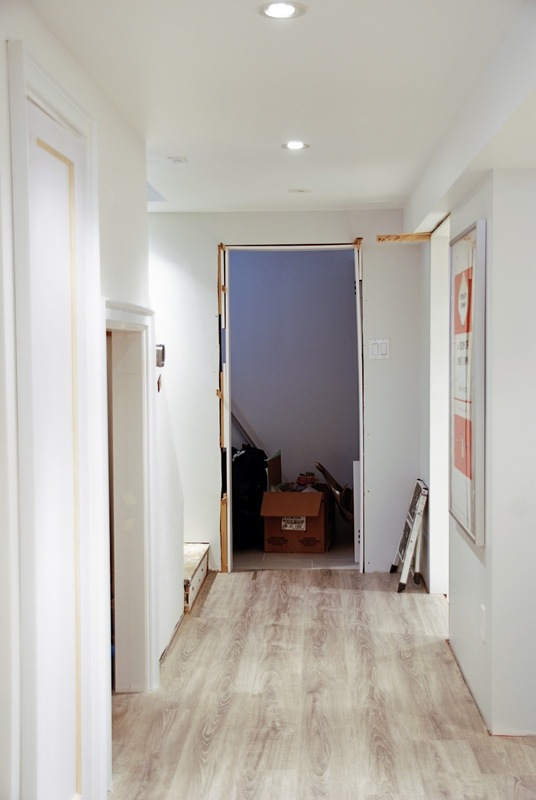 To be honest, it doesnt even look/feel like a basement which is super awesome! The openness of the space makes the basement so roomy and such a nice place to hang out. Love all the small details around the basement, hardware, bead boards.....can't wait to see more! Oh Jen, this is all so perfectly YOU. Amazing job! And I love love love the Alanna Cavanagh print, I'm such a fan!! It is absolutely beautiful...So I wonder if those cabinets are going to hold up. I thought about using them in our kitchen. They look really well constructed, plywood frame, soft-close, and the painted door is actually a laminate. They feel quite sturdy, similar to the semi-custom cabinetry (AyA Kitchens) we have in our kitchen. 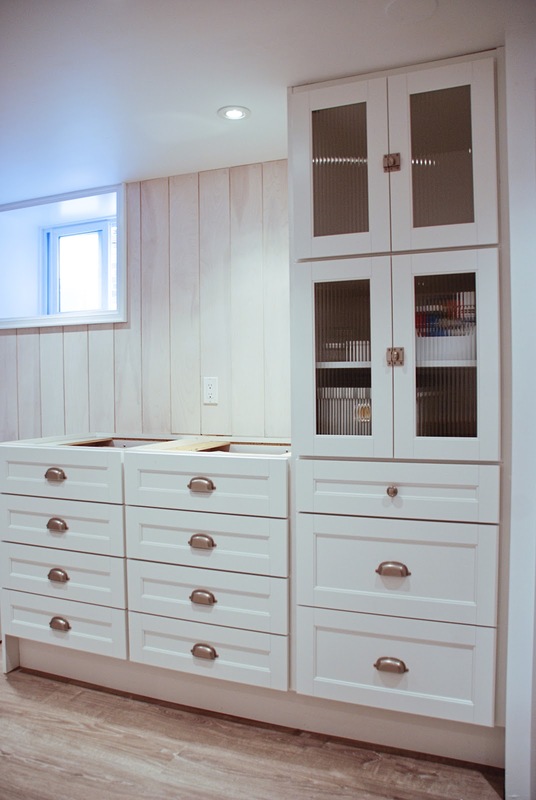 Holly over at In The Fun Lane has had these cabinets for a few years in her kitchen. She might have some thoughts on how they've held up. Oh wow, this is fabulous Jen - you must be on cloud nine. Those white-washed boards are perfect with the floors! And holy storage. Plus, that is my favourite Alannah Cavanagh print (along with the scissors). You will definitely be spending a LOT of time down here this winter I can tell! :) Congrats you guys. Oh Jen - it looks fabulous. I can't remember if you said what you are using for the counter but a hole in the desktop and the tie wraps that screw to the wall should tame the cables and cords. And future changes to the pieces and parts are easily handled. Do you have enough of the wall boards to make some sort of door to cover the electrical panel? Vertical boards to match the wall with Z brace wouldn't look out of place. I can't tell if there is any room in the corner for a hinge but if not you could hinge it at the bottom for ease of access. I'm sure you guys will come up with solutions that match the rest of your wonderful renovations. Thanks for letting us see the process (and suggest options). The planning you do is educational and inspiring - maybe I can do as well if I spend the time planning and paying attention to details before starting. Thanks Cheryl! HandyMan had the same thought about using the wall boards to make a cover, but I think we might want to do something different and fun in that corner. We'll see what happens! Thinking about the details really does result in a better overall design, I think. At the very least, you can avoid making some costly mistakes that you have to fix down the road. Looks incredible! Love the photo of Chloe running through - great skills on that one. It looks like a dream, even if you stopped right now! But I know you won't - looking forward to hearing about all the other details going in. Amazing! It's so bright, pretty, practical...and the print is a beautiful punch of colour. Great job! What an amazing remodel! So inspirational. I'm considering doing something like this in my own house, but I'm still in the planning phase. Just one question: Do you have to worry about moisture in the basement? We didn't have any signs of moisture when we ripped out the old carpet. We did install a DRIcore subfloor which is a great barrier to moisture should any develop. Wow, what a transformation! Despite you thinking that it still needs a lot of work (do we ever stop thinking that about our spaces? ), I think it looks amazing. Can't wait to see the rest. The click is one of my favourite things! You're welcome any time Tim :) Yes, the column isn't so bad wrapped with the MDF. I was worried about it, but it disappears. wowee zowee it looks fantastic! We used Martha cabinets in our recent kitchen renovation and really love them. Way to go! Thanks! I just peeked at your kitchen reno - awesome!! The Martha cabinets are spectacular, aren't they? So nicely built. The basement is looking awesome!!! Can I ask which Tonic outdoor fabric you chose to go with for the banquette cushion? I love the colour! Did you pick outdoor fabric so that stains won't show? I have small children and I don't think I could handle tomato sauce on my new bench cushion, LOL. I actually got the fabrics from Designer Fabrics (https://secure.designerfabrics.ca/shop/scripts/prodList.asp?idCategory=94). Sorry, but the exact one I used doesn't seem to be on their online site. I bought it in store. Its a soft heather grey in person. I did pick an outdoor fabric so that the bench will be more resistant to stains. We'll be crafting in this area so I hope it repels paint and glue! I'm so glad you showed it , I love to see all the steps. I hate being made to wait and being teased , I guess some people like that? 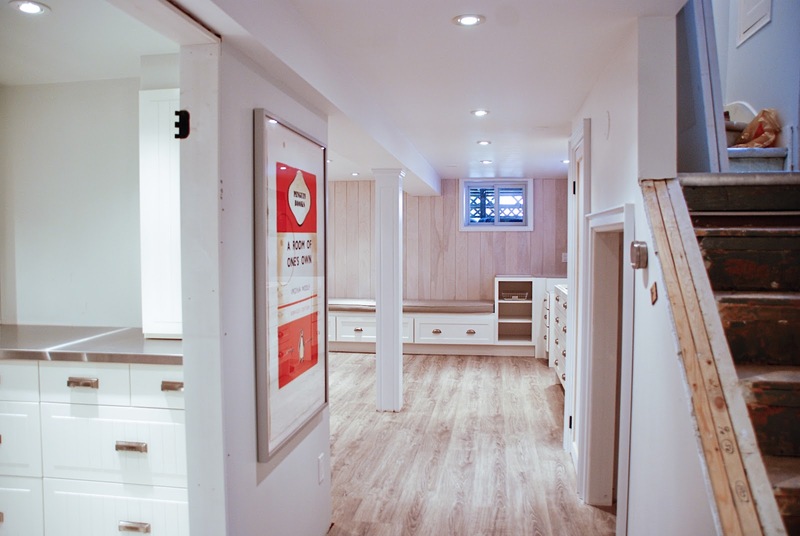 I love the basement , it's beautiful, crazy about the cabinets, its all beautiful. 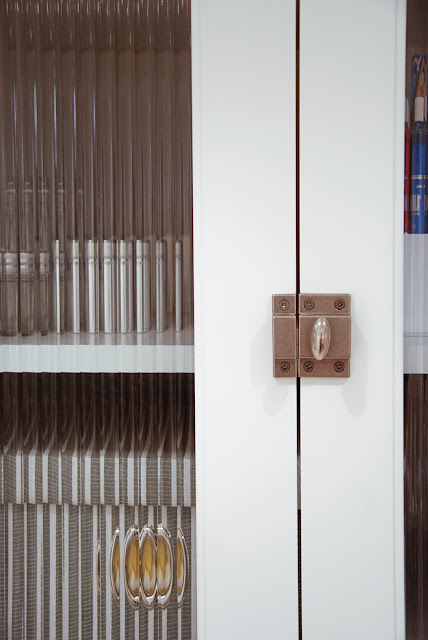 Yes, the architect husband is particular about those details :) The cabinets were a perfect fit. Oh my word! I love everything and seriously have basement envy! It truly is a "Room of One's Own" - the words on the print are so fitting. It looks amazing Jen! How exciting to see your vision come to reality. And that Alanna Cavannagh print is perfect! It looks awesome, great job! Such a incredible space now. Beautiful. 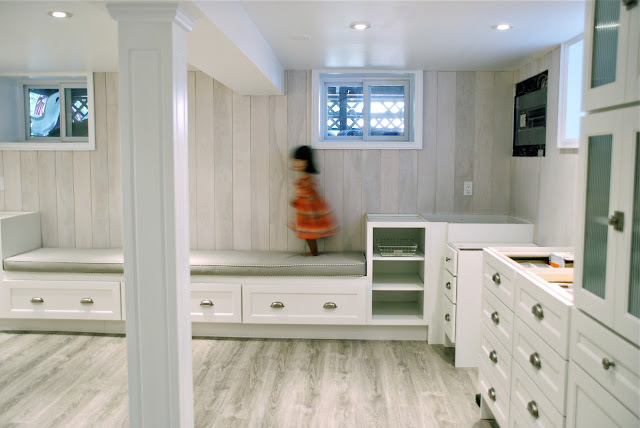 I am in love with the floors (and the cabinetry of course!). 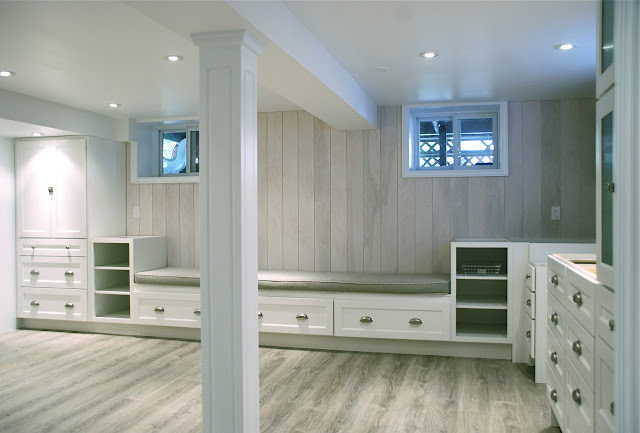 It's amazing how bright and beachy your basement looks - if only all basements could be so happy. It's looking great! You're in the home stretch now! Wow! It looks fantastic! So much space, and so much storage. Wow, it's gorgeous! I love the cabinets and the floors. Great job! It looks phenomenal so far jen. I'm jealous of all that storage! Fantastic space!!! Love how it is all coming together- the bench is amazing!! It looks so amazing! I am insanely jealous of those cabinets....pretty storage on every wall. I can't wait to see it when you are done. That's a magnificent basement! I want a basement like that as well! And the banquette! wow so bright & fresh. Those cabinets are perfect for the space. So much fabulous storage!! thanks for sharing! Looks great. All that cabinetry is amazing!